This goal can be easily changed to accommodate football or soccer. Soccer goal is official 24’ x 8’ (732cm x 244cm). Goals are constructed of 2" (51mm) x 2" (51mm) x 14 gauge rectangular steel tubing and 2" (51mm) x 3" (76mm) x 14 gauge steel tubing ladder style crossbar. Uprights 20’ (610cm) H x 2" (51mm) x 2" (51mm) x 14 gauge OD steel tubing. Finished with an attractive and durable white powder coat. 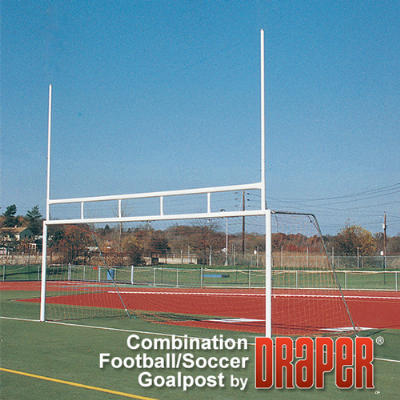 Optional soccer backstays are 1-5/8" (41mm) OD x 14 gauge steel tubing. Goal provided with net attachment system. Order 505015 Soccer net separately. Order optional 505098 aluminum ground sleeves with cap for semi-permanent installations.